The Adobe CS products save information (and other metadata) on relations between files embedded in the XMP block of the file. When a file is imported or checked in, Elvis extracts this XMP information and saves it in the search index and creates automatic relations where possible. This opens up the possibility to search for related files when new files are imported. There are different areas (namespaces) in the XMP metadata block, the media management root namespace (xmpMM) contains all relevant information for creating relations. The namespace is filled with file pathʼs and unique identifiers - GUIDʼs - which uniquely identify a file, a related file or a referenced file. 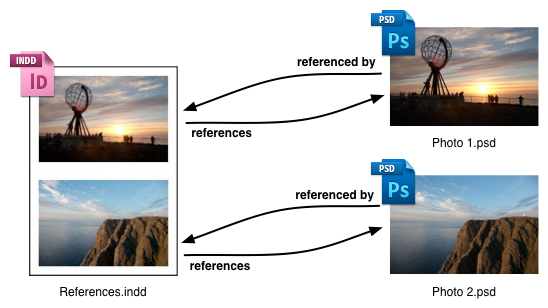 Detailed information on the XMP structure is available in Adobe XMP SDK documentation. documentId - created once for new files, different renditions are expected to have different values for this field. instanceId - changes with each save operation. originalDocumentId - links a resource to its original source, for example, when you save a PSD document as a JPEG, then convert the JPEG to GIF format, the immediate source of the GIF is the JPEG, and the original source is the PSD. The value of originalDocumentId in both the JPEG and GIF files is the value of originalDocumentId from the original PSD file. The instanceId of the current file can be listed in the history block of another file already available in Elvis. Itʼs also possible that the current file contains history instanceIds which can be linked to instanceIds of other files which are already in Elvis. Note: We’re not matching on history instanceIds older than the second last “saved” or “created” action as this can lead to creating too many related relations between files which are not or only vaguely related. xmpReferences - structured object containing all of the above, essentially a list of placed files where each file contains a referencedInstanceId, referencedDocumentId and a lastURL. Following are a few samples of XMP output to illustrate a few automatically created relations.